Hello my fabulous friends! Another glorious week. I’ve got a new webinar coming out for you guys soon – it’s awesome and you’re going to love it. So I’ve been plugging away at that and getting it all ready to bring to you so that’s been super fun. I’ll give you more details when that’s ready so you can sign up and tell all your friends and family because they’re totally going to want to sign up too and not miss it. It’s good! Okay, I hope you’re ready to dive into another fantastic topic because this one is awesome. I want to talk to you all about confidence today. If there is one thing that we all as humans share as a commonality it’s this, that we all have some area of confidence that lacking. We’re all a bit self-conscious in certain areas of our lives and as a result we tend to hold back and remain limited in what we’re creating in the world, whether that’s in our relationships, our goals, work, everything. Our level of confidence plays a huge role in our lives and what we’re able to create, contribute, and experience. I’ve broken this topic up into several segments. I’m not going to do them consecutively either. I want to give you this first bit and then let you digest it for a while. I want to give you time to implement it and really apply the tools I’ll offer today before I give you more so today, it’s self confidence part one. Let me ask you a question, Are you a confident person? There are few people that honestly rates themselves as a 10 or anywhere near that. 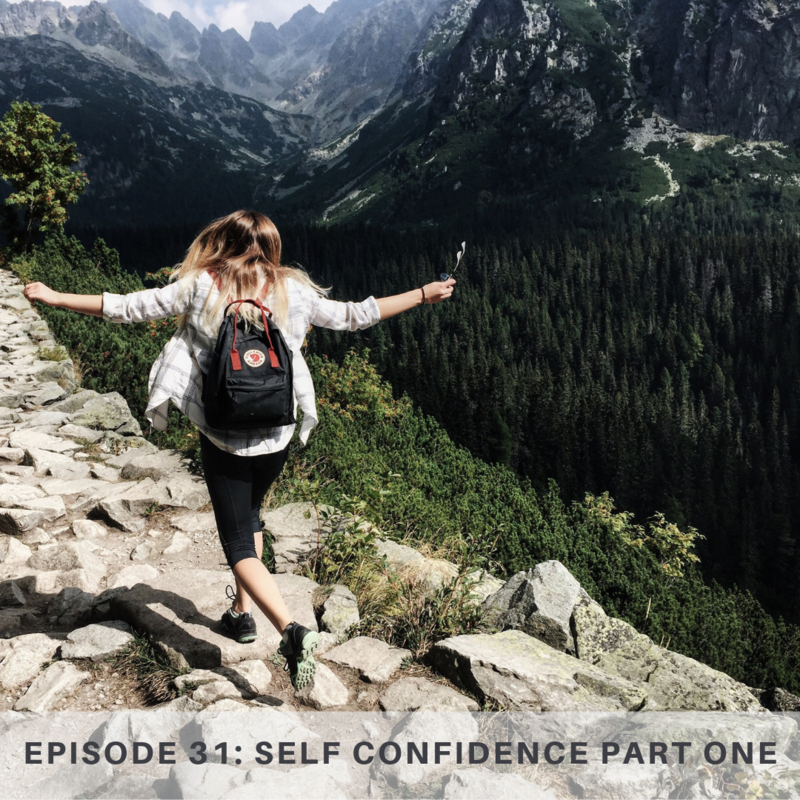 We tend to have this misconception of what confidence is, where it comes from, how to get more of it and I hope today to clear some of that up. I just read this book on confidence. It was a book that was supposed to have a ton of exercises to build your confidence and I thought that sounded like a fun resource to add to my tools but when I read it I was sorely disappointed because the entire book was well meaning but entirely misplaced and in my opinion wrong. The book was full of all these ideas and tips of things you need to do to gain confidence. Some ideas were: fix your teeth, wear nice clothes, exercise, sit up straight and while I’m sure these ideas can assist in your overall well being it’s definitely not where self-confidence comes from. There are plenty of fit people with perfectly beautiful teeth, clothe that are still terribly insecure. I watched a Ted talk a while back about a model that shared what it was like for her – what that industry was like and she shared how insecure and not confident she and all these other models were. Which is fascinating because many people look to them like, they’ve got it made and they’re still just as insecure as everyone else. And with all this confusion about what it is, where to get it, what we need to do/be to have more of it it’s no wonder why so many people struggle with it. Today I want to teach you what self-confidence IS and what it’s NOT. First, self-confidence is NOT something you have to DO. You don’t have to buy a single thing. You don’t have to have a certain degree or weigh a magic number. It’s not a circumstance. Self-confidence is a FEELING. I hear a lot of people say, I’m not confident- like it’s a fact. Like it’s something we’re either born with or we’re not. but we need to understand that it’s not a label for ourselves. There isn’t a blood test we can take that will prove, “yep…this one, not confident.” It’s a feeling. It’s a feeling YOU create. So we need to adjust how we talk to ourselves about confidence. It’s not, I’m not confident. I’m not a confident person. It’s a, I don’t FEEL self-confident. Knowing that it’s a feeling is wonderful because it’s something you can control. It’s something that you create and it’s something that you can use your agency to control. Instead we think that we either have it or we don’t. Other people have it and boy, do I wish I was blessed with some of that. No, it’s a feeling and your CAN create it. We have this notion that once we have self-confidence then we’ll think and feel better. Our lives will change. But that’s not how it works. You have to clean up some of the clutter in your mind and then you can generate the feeling of confidence and because of that progression – thoughts that create feelings those feelings motivate you into action – in this case, positive, confident action which will create your results. I was talking with a woman recently who had an interview coming up. She said that wanted to nail that interview because then she’d be more confident. Like, once she proved to herself that she could do something THEN she’d feel confident and I was like, noooo…that’s backwards. That’s operating from the belief that we have to do something to FEEL something and that’s not how it works. You need to change your thoughts that will create the feeling of confidence and then because you’re feeling confident you’ll rock that interview. It’s like that movie, I feel pretty. The only thing that changed for her was her thoughts. I don’t know if you’ve seen it, we actually bought it edited because I liked the idea of it but heard it had some questionable parts so if you haven’t seen it maybe go the edited route. But I did love that she wanted to be confident but she didn’t think she could be because of how she looked, so she accidentally hits her head and then she believes she’s this gorgeous model and because she thinks she’s this model she feels confident and then takes massive positive action and because of her actions she made huge contributions. But nothing changed in her physical world. She looked exactly the same as always. She didn’t go out and take a bunch of trainings or more schooling. She didn’t whiten her teeth. The only thing that changed was her thoughts. We have to THINK confidently to generate that FEELING of confidence in order for us to CREATE or take ACTION that gives us the results we want. I love the example of pouring water. To a toddler they might not FEEL confident that they could pour a glass of water without spilling. But to an adult that has been practicing that for decades, it’s a no brainer. The adult has all the confidence in the world that they could pour a glass of water. In fact when an adult sees a toddler getting ready to walk across the room with a full pitcher of water they’re more likely to rush over and offer assistance because they are confidence that they can get the water over to the table safely without spilling it and needing to clean anything up. They might say they’re confident because they’ve practiced it but that’s not it. They’re confident because they believe they can pour the water. Because they have that belief that pouring water is easy they feel confident and then take those actions. But we’re taught to believe that our actions, what we DO creates how we feel. We think we have confidence because of our actions. We think as adults that we have confidence to pour that glass of water because we’ve done it so many times – it’s the action that creates the feeling but it’s not. It’s the thought that, “I can totally pour this glass of water” that created the feeling of confidence which motivated you to go for it, to pour that glass of water. It’s also the thoughts of, “I’m going to spill it. I’m going to fail. I can’t do this.” That creates fear, doubt, worry, and more often than not, we spill the water because of our initial thoughts. Our actions do not create our confidence. It starts in our minds. It starts with a thought. The definition of confidence is: Knowing and embracing all the parts of you and trusting in your abilities. I love this definition. It doesn’t say that confidence is being good at something. It says that you know all the parts of you, that you embrace (hug, love, accept) and that you trust yourself. Trust that you will keep commitments to yourself. Trust that you have your own back. Trust that you can do what you set out to do. It doesn’t mean that your abilities are perfect. It means that you trust yourself to keep going, that you can do it if you don’t give up, and that you’re going to be okay because you take care of you. We have this problem though when we look to others for our confidence. We want others to fill our buckets. We want others to tell us that our abilities are sound. That we’re good. So when we get praise and compliments from others we feel better. We feel more confident. We take their words as evidence that, “okay, now I can be confident because others approve of me. They like me.” Then we feel confident but this is a dangerous and slippery slope my friends. Because what if the tables turn. What if they tell you things you don’t like. What if they don’t accept you. What if they don’t like you or what you do? You have to recognize that confidence doesn’t come from outside sources. It comes from YOUR thoughts. Sometimes we’re shaken by their words because we haven’t taken the time to get to know ourselves well enough. We’re hurt, not by their words but by OUR OWN belief that, “they could be right. Maybe I am like that. Maybe I’m not worthy. Maybe I’m not lovable, likable” – that’s what hurts. That’s also what creates the insecurity. So the key to developing self-confidence is to get to know yourself. It’s like if someone comes up to you and they start in on how that green star on your belly looks atrocious and ugly. (I’m referencing Dr. Seuss’s speeches by the way). If you know yourself well enough you’ll know that you don’t have a green star on your belly. It won’t bother you because you know better. But most of us don’t take the time to get to know ourselves enough so when people say things to us we’re shaken because, what if they’re right? Maybe something is wrong with me. No. Nothing is wrong with you. You are 100% whole and worthy and perfect just as you are. I’ve thought about this quite a bit – if you think about all those all over the world, different ages, different home setting, different circumstances, health issues, everything – the answer to all of it is to teach them their identity and their purpose? HOW? But that’s what I want you to think about today. I want you to realize that the results we want, the changes, the relief, the peace, the hope, the confidence – all stems from your thoughts, your beliefs, the knowing who you are and what you came to earth to do. How differently do you feel when you believe you are just a plain ol’ person. Nothing special. Nothing of any significance. Versus knowing that you are set apart, divine, Royal. Nothing physical changed. The circumstances are still the same but that belief, that thought changed everything. Knowing who you are. Knowing what your purpose is. Embracing all that you are, and who you are becoming is the key to creating confidence. It is your thoughts. Your thoughts create how you feel. What you think about yourself will determine how confident you feel. We recently watched this movie, that I’m not recommending but I did like this one scene where they main character was failing again and again and again this test he was trying to accomplish and even though he failed so many times he remained confident. He smiled and excitedly said, “It’s okay! I’m just going to take it again!” He felt confident not because of what he was able to do but because he knew who he was, the kind of person that would pass this test. Embracing that he wasn’t there yet but trusting that he would succeed eventually because he trusted he wasn’t going to give up. It’s imperative that we don’t misplace our confidence on our actions and being good at something equates to feeling confident. People think that when I weight a certain weight, or look a certain way, or earn a certain amount of money, or accomplish a certain thing THEN I’ll be confident. It’s proof that I’m good, that I’m worthy, that I’m succeeding. This is opposite of the truth. Confidence is knowing that you’re good, worthy, progressing NOW and that because you feel confident that you’re able to conquer your goals and challenges. It comes from your thoughts. Knowing who you are, embracing all the parts of you. Loving all the parts of you – even the parts you still want to refine and trusting that you can do it, that you will do it because you take care of you. The first step to having rock solid confidence is knowing who you are. Getting to know you. Changing your thoughts about who you are and who you aren’t. When you know this it won’t matter what others say, think, or do because you know you. You love you. You have confidence that you can and will accomplish what you need and want to do. One thing that comes up pretty frequently when we talk about confidence is the idea that it’s bad to think about yourself. It’s conceited. It’s prideful. We should be focusing on others and not ourselves. But this is misplaced. It actually has the opposite effect too. When we don’t take the time to think about ourselves and developing confidence we spend WAY more time inwardly thinking and it’s usually not helpful or useful. When we’re not focused on learning about ourselves and how to create genuine confidence we’re too wrapped up in ourselves and wondering what’s wrong with us. What does that person think of us. What if they think I’m…Do I look ugly in this? What if I sound dumb? Etc. We can’t focus fully on others if we don’t take the time to fill our buckets first. Taking this time will actually free yourself up to love others and forget yourself and get to work because you have confidence that you’re worthy, that you’re perfectly growing, and that you’re going to be okay no matter what because you take care of you. There’s a reason why President Nelson said that the key to solving your personal challenges is in learning WHO YOU ARE and your purpose. There’s a reason elder oaks tells us that we owe it to ourselves to get to know ourselves in every detail possible. Every detail possible. I love that especially because it’s not a one time thing. It’s not a 5 minute thing. It’s a constant learning, loving, accepting, embracing, practicing loving, being curious thing. It’s stopping to recognize that we’re not of our own creation but of Heavenly Father’s creation. We owe it to ourselves to get to know ourselves, to learn to love and appreciate ourselves in every detail possible because the more we do, the more we’ll have to give others. The better service we’ll be able to offer. The more attention we’ll be able to give others because we’re not wrapped in our own insecurities. I love this exercise that I do with groups and clients sometimes when we talk about confidence. Pause for a moment and think of your favorite place in nature. What is your special place? Are you a mountains kind of person? Or more of an ocean person? You can be both but for now just pick one place. Visualize yourself being there. We went to Yosemite this summer and went on a beautiful hike. So I’m picturing being surrounded by redwoods and evergreens. I’m imagining the pine smell and Feeling the cool breeze across my face. I can hear the sounds all around and am noticing the pinecones littered all over the slightly damp and muddy floor. What is your place? What is your special place? What are you seeing, hearing, smelling? What are your thoughts about it? Why do you love this place? What is it specially that is so special to you? I have beautiful thoughts about Yosemite and about nature because when I think about it. I see Heavenly Father’s creations. I’m amazed at the magnitude of the tall trees. The vibrant colors. All of it is perfect and amazing. I love it because He created it. I’m not nitpicking it apart by complaining that every tree, branch, pinecone isn’t perfect. The fact that this tree is crooked and that that pinecone is one the floor is all part of the beauty. It’s easy to embrace the “imperfections” because it adds to the perfection of the whole setting. It’s incredible, all of it. I know that it’s God’s creation. I embrace all of it and I trust that this is perfect for the creatures that call it home. If I asked you to make a list of ten things you love and appreciate about that place could you think of ten? Easy, right? But now, if I asked you to make a list of then things you love and appreciate about you, could you? How hard would it be for you to name ten? This is REALLY difficult for a lot of people. I’ve coached a lot of people that come to me hating themselves. They hate their bodies. They hate the way they look. They hate that they’re not good at something yet. They’ve spent so much time talking so negatively to themselves it’s a real stretch and challenge to interrupt that thought cycle. We’re too narrowed in on our perceived faults, failings, imperfections, and inadequacies. But what if you realized these are all just thoughts. To one person that pinecone being on the floor could be viewed as an imperfection and to another it’s all part of the overall beauty. It’s a thought an opinion. One thing that was really helpful for me making this transition was starting with neutral thoughts, more factually based thoughts. Instead of thinking I hate how I look, I could replace it with, I’m a human being. I’m a child of God. I’m a daughter of God. There I am. I have a body. Things like that. I didn’t expound on those thoughts at first. I just stated the obvious. These neutral thoughts. It was giving my brain something to think, something it couldn’t argue about. It was like, yep, you’re human. Yep, you have a body. And it WANTED to add in ugly side notes but I didn’t let it. I just kept repeating the neutral thoughts and eventually the loud chatter was lessened. Eventually it stopped. Then I could replace those with the next thought, “I’m a daughter of God”, Then I could replace that with more and more positive thoughts. You have to stop or interrupt the cycle and get out of negativity before you can start believing the positive truths about you. Before you allow yourself to inquire more about yourself. You have to learn to be neutral with yourself first so you can make room for curiosity and that space of getting to know yourself. Think about this. If you already have an idea and belief in your mind that the new teacher is going to be awful and terrible then there’s no room to notice if you really like them. You’re just focused on the negative and as a result, that’s what you’re going to see. If I went into the hike in Yosemite hating it from the get go I would have found things to hate. I would have complained about the mud, the bugs, the weather, the smashed pinecones, the lack of cellular reception, etc. But when I went into it from a neutral space, I could look around and marvel at the beauty around me and notice all the little details, like the pinecones all around, that made it all just so magnificent. You are one of God’s creations. Can you love and appreciate you solely because He made you? Can you get yourself to a neutral space so you can allow for wonder, curiosity, and appreciation? I challenge my clients to come up with a list of 10 things they love about themselves with me. We do this work together and start small. Then after they see that they came up with ten I ask them how they’re feeling. Their demeanor has changed. They feel better, more confident, more loving to themselves and grateful to Heavenly Father. If it really is true that the answer to any personal challenge rests in “knowing who we really are and what our purpose is” then we should invest the time it takes to get to know ourselves. To learn how to create confidence for ourselves and because of that confidence that we can go and do wonders in our families, in our communities, and in the world. The only time it gets to be arrogant is elevating yourself above others. It’s thinking that I’m better than others because … But confidence and love comes from knowing, embracing, trusting yourself in every detail. Thinking you’re amazing and so is everyone else. There was a conference talk ages ago that talked about how the adversary wants us to see each other as a bar graph. That so in so has this huge quantity of accomplishments and so in so has only a teeny bit and you’re somewhere in there too. But looking at it like that it’s looking up to or down upon others. He said that God doesn’t look at it from the side. He has an aerial view. All he sees are even boxes. He just sees us and from the top that bar graph looks the same. We’re all amazing. We’re all beautiful. We’re all 100% worthy. Going back to the exercise with your special place in nature. Is there one scene that is “better” than others? Is the beach better than the mountain terrain? Is the forest prettier than the ocean? Is the snow better than the endless sands of the desert? They’re all amazing. They’re all beautiful. They all have different qualities that make them different, unique, full of different options and possibilities but they’re all magnificent and they’re all His. We may all look different and have different gifts but we’re all amazing. We may all have different tastes, preferences, likes, passions, interests, talents, gifts, qualities but we’re all magnificent and we’re all His. Start here, my friends. I encourage you to do this exercise. Start with ten. Embrace where you’re at. If it’s difficult to start then start with neutral thoughts. I’m a human. There I am. I have a body. Then step by step add to those thoughts. I promise you, it will get better. You can train your brain to think new thoughts, to believe new thoughts that serve you. Then start your list and keep going daily. I write ten things down everyday that I love and appreciate about me. I’m learning everyday in every detail possible about who I am. These thoughts generate confidence. I’m not bothered if someone comes up to me and complains about my curly hair. It’s okay that they don’t like it. They don’t have to. Because I like it. Because I know me well enough to love me fully and to allow them to have their own preferences. I recognize that while compliments are nice – who doesn’t love a compliment, that it’s not what creates my confidence . My confidence comes from my thoughts. What I believe about myself. Knowing and embracing all the parts of me and not in what I can or can’t do but in who I am and what I know I can accomplish if I keep working at it because I believe in myself and in my abilities and trust that I have Heavenly Father to guide me. If I’m constantly seeking and relying on others to approve of me, to give me confidence then I’m always going to be seeking. Always trying to find someone to fill my bucket. Confidence comes from believing in yourself. Knowing yourself. Loving yourself. Embracing yourself – embracing what you can do and what you can’t do and knowing that you’re going to be okay now matter what because you trust you to have your own back. Instead of thinking about others and what they think about you, what their opinion of you is, what is YOUR opinion of you? Confidence comes from within. Confidence is a feeling which is a direct result of your thoughts. Start with your thoughts, my friends. Start today taking the challenge and responsibility to get to know yourself in every detail possible. Okay, let me know how it goes! I’d love to hear from you! Don’t forget to leave a review on iTunes if you haven’t yet. I’d love the love! Thank you all. Talk to you next week, my friends.